One of Canada’s most important positive policy reforms over the past 15 years has been on corporate taxes. Federal and provincial governments of all political stripes realized the economically damaging effect of corporate income taxes and lowered rates to make the business tax regime more competitive. This includes Jean Chrétien’s federal Liberals, Gordon Campbell’s BC Liberals, Ralph Klein’s Progressive Conservatives, Lorne Calvert’s NDP government in Saskatchewan, Gary Doer’s NDP government in Manitoba, Shawn Graham’s New Brunswick Liberals, and Dalton McGuinty’s Ontario Liberals. 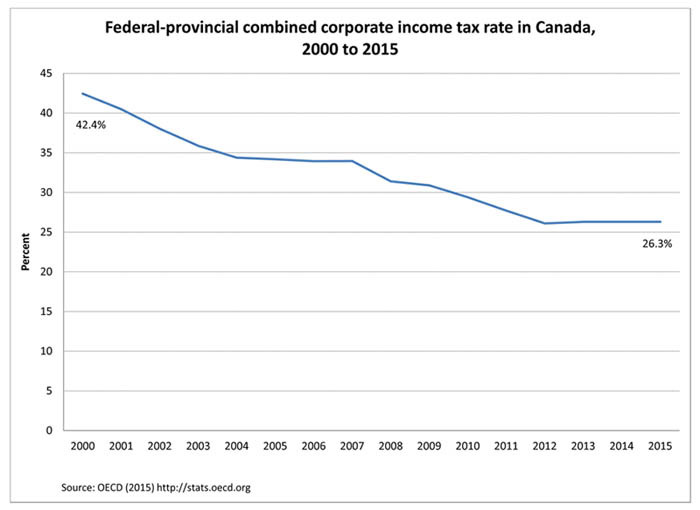 As a result, from 2000 to 2015, Canada’s combined federal-provincial corporate income tax rate fell dramatically from 42.4 per cent to 26.3 per cent (see chart below). The cross-party agreement on cutting corporate taxes is because of the significant benefits provided to all Canadians by making the economic landscape more attractive for investment. Jurisdictions that lower business taxes increase the after-tax rate of return on investment. And increased returns improve the incentives for investment. When businesses invest in machinery, equipment and technology, workers have more capital to work with and can produce more and higher valued output for each hour they work, making them more productive. Because increased productivity leads to higher wages, workers, in the end, benefit greatly from corporate tax reductions. And increased investment can also lead to more jobs and a faster growing economy. Unfortunately, we’ve seen some backsliding recently with governments in Alberta, British Columbia and New Brunswick raising corporate taxes. And now, federal politicians are making pronouncements along these lines. But in the past, Liberal, NDP, Conservative and Progressive Conservative governments all reduced corporate tax rates to improve our economy because the evidence on the beneficial economic impact of lower corporate taxes is well-documented (see also here). For instance, a recent Department of Finance Canada study analyzed corporate tax cuts implemented by the federal Liberals between 2000 and 2004 and found that each 10 per cent reduction in the after-tax cost of capital increased the amount of capital by 7 per cent. In a study led by former World Bank Chief Economist Simeon Djankov, the authors analyzed data from 85 countries and found that higher corporate taxes produce negative economic effects including reduced investment and entrepreneurial activity. An OECD study explored the direct relationship between various taxes and economic growth for 21 developed countries over the period 1971 to 2004. While personal income, consumption and property taxes all had negative effects on per person income growth, corporate income taxes had the most damaging effect. A similar result was found in an analysis of Canadian provinces by professors Bev Dahlby and Ergete Ferede: higher corporate taxes are associated with greater declines in the tax base compared to other taxes. Aside from the formal studies, Canada’s recent experience is telling of the beneficial results of tax reductions and fiscal reforms, which helped drive strong economic performance relative to the U.S. and most other G7 countries over the period 1997 to 2007. As corporate and other taxes declined, Canada outperformed other countries on investment growth, job creation and overall economic growth. The reality of the global economy is that countries compete with one another for investment, so any advantage is critical. And the corporate income tax rate is an important component of a positive economic environment. 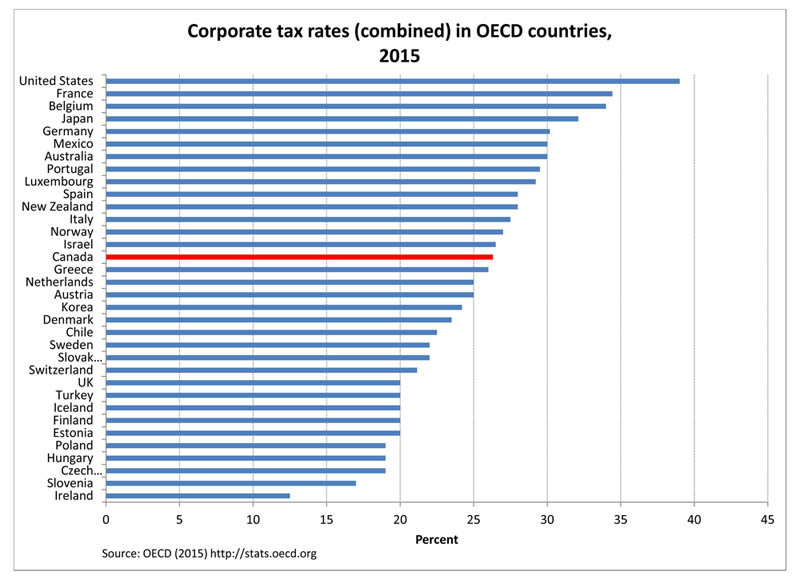 Yet, according to OECD data, Canada’s combined federal-provincial corporate income tax rate (26.3 per cent) is currently 15th highest among 34 OECD countries (our statutory rate, however, is much lower than the U.S. rate of 39.0 per cent—see chart below). The evidence is clear: raising corporate taxes is bad economic policy.